Here is background information on how to grow grains well-suited to this climate. See this research link for more detailed information on the grains. Barley can grow in almost any climate and is very adaptable, but it does favor a cool ripening season and low moisture. This makes it particularly well-suited to production in the northeast. There are two main types of barley: two-row and six-row (more common). Barleys are versatile and can be grown for feed, to be malted and used to make alcohol, or as a cereal grain. However, barley on its own does not have enough gluten for bread, and so it must be mixed with another grain for that purpose. Dry beans have been grown in the northeast for a very long time, being a particularly good source of protein, lysine, and threonine, and a relatively easy crop to grow organically. There are many different types of dry beans, and consumers can find dry beans in bulk or precooked and canned. Plant beans once the danger of a frost has passed, and harvest about 90 to 100 days later, in dry conditions. Shell beans must be removed from the pod before they dry; many other varieties, including soldier beans and white beans, can be harvested with a combine. It is important to handle and dry beans carefully to avoid damage to their thin seed coats. Growing dry beans in the northeast (pdf). Growing dry beans in Vermont (pdf by Winston Way, UVM Agronomist). Buckwheat is a very nutritious grain (high in lysine, an important amino acid) that can grow in poor to medium quality soils and does well in a wide range of climates. The crop grows quickly and vigorously, therefore doing well against competitive weeds, and is rarely damaged by insects or pests. Processing buckwheat can be difficult because of its thick hulls, but with the right equipment, it is a very feasible grain for northeast growers. Growing buckwheat in the northeast (pdf). Canola is grown for oil production, and can do well in the northeast under the right conditions. In our climates, canola is planted in the spring and harvested in late summer or early fall, and is valuable for its oil, which makes up as much as 40% of the crop. Canola is a great crop for green manure, as well, because harvesting it in autumn will leave stubble for the winter, and because canola is high in moisture and nitrogen, it breaks down quickly in the spring and adds a great amount of nutrients to the soil. Growers should beware of Sclerotinia, a mold that develops on rotting flower petals and leaves. Growing canola in the northeast (pdf). Grain corn has been grown in the northeast for generations. Although it requires high levels of nitrogen and more maintenance than many other grains (because it is a row crop, and susceptible to disease), corn is a popular grain. It is a high-energy food source for animals and can also be grown for popping corn or for milling into cornmeal for human consumption. Growing corn in the northeast (pdf). Flax can be grown in the northeast and is primarily used for its oil, but can be used as a whole grain, fed to livestock and poultry, ground into flour, or grown for its fiber. Flax flowers for weeks and each 5-petaled flower has a boll with 6-8 seeds. These small seeds can be difficult to harvest but are very versatile. Growing flax in the northeast (pdf). Millet is a very nutritious grain that is grouped into four different families, with Proso, or broomcorn, millet being the type that is grown for human consumption in the United States. The heads of this millet open and look like small broomcorn heads; other “millet” heads are more cattail-shaped. It has a slightly nutty flavor (enhanced if you brown the grain before cooking with it) and can be used in many recipes. 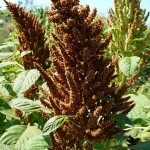 Millet can grow in moist or dry soils and will mature quickly. In the northeast, millet should be planted when the soil has warmed up to approximately 60 degrees, and is usually harvested in October. 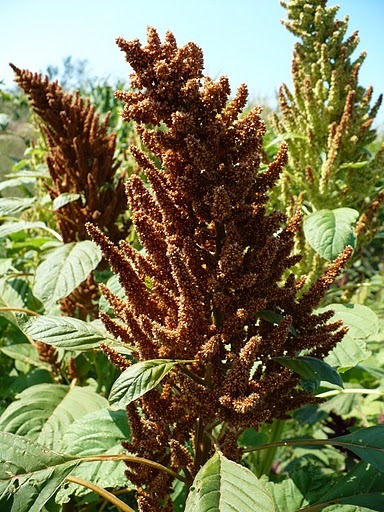 Growing millet in the northeast (pdf). Oats do well in cool, moist climates and are often grown as a cover crop or interseeded as weed control. However, they can be grown and harvested as a cereal grain as well. Oats should be planted in the spring and harvested in late summer or fall (or about 12 weeks after planting), and will germinate quickly and do well in seasons with adequate rainfall. Processing oats is similar to drying and threshing wheat, but with a few added steps: they are generally hulled, steamed, and then flaked or steel-cut for human consumption. Growing oats in the northeast (pdf). Peas have been grown for green manure, animal feed, and human consumption for a very long time. Edible field peas are high in protein and can be used as dry peas or ground into pea flour. They can do well in a variety of soil types, as long as the field is well-drained and low in saline. They are often grown with another crop to help minimize weeds, and can be planted in April or May, then harvested in late summer or early fall. Growing peas in the northeast (pdf). Rice can grow in the northeast under the proper conditions, and aspiring growers will want to learn more about aquatic agriculture before beginning. When growing rice, it is important to control water depth for temperature and weed control, develop a solid stand of plants, fertilize your soil, and harvest and dry rice properly before processing and storing. Growing rice in the northeast is a new idea but a handful of adaptable farmers are growing rice with success! Rice is grown in shallow water in an irrigated field, and can be direct-seeded or transplanted as seedlings in approximately mid-May. When the rice matures in early fall, it is harvested, dried, threshed, hulled, and, if desired, milled. Growing rice in the northeast (pdf). Linda and Takeshi Akaogi’s 2009 Rice Growing Manual for the Northeast USA (pdf). Cereal rye grows well in cool, damp environments, and although its yield is not as high as wheat, it can be made into very delicious bread. According to some bakers, rye grown in the northeast has more bran, sugars, and ash, as well as better overall flavor, than rye grown in the midwest or elsewhere. Ergot, a fungus that appears as a black infestation on seed heads, is a common problem for cereal rye growers. Growing rye in the northeast (pdf). Sorghum (which is categorized as grain, silage, or sweet) is an annual grass similar in many ways to corn. It is mostly grown for animal feed in North America, but grain sorghum (or milo) can also be consumed by humans, either as a coarsely-ground cereal or ground into flour. Sweet sorghum can be pressed to extract its sugary juice, which is further refined into a thick syrup. Sorghum is extremely water-efficient and can tolerate both droughts and flooding, but is difficult to grow in the northeast’s cool climate. Growing sorghum in the northeast (pdf). Soybeans are a very high-protein pulse crop (usually about 35-40% protein) that have a long history. They can be grown in the northeast and germinate well in moist, fertile soils. Care must be taken during the harvest to prevent shattering and cracking the beans because of their thin seed coat layer, but if harvested, dried and stored properly, they are a great crop for the northeast, as animal feed, for human consumption, or as an oil product. Growing soybeans in the northeast (pdf). Spelt grows well in a number of soil conditions, and is increasing in popularity in the northeast. Many gluten-sensitive individuals find spelt to be a good substitute for other grains, and spelt is high in protein. In the northeast, spelt is planted in fall and harvested the following year, in late summer or early autumn when the straw begins to yellow and kernels reach physiological maturity. After harvesting, spelt is dried, threshed, de-hulled, and processed into flour. Growing spelt in the northeast (pdf). Sunflower can be grown for seed and for oil (both food-grade and for biofuels). Sunflower is typically planted in mid- to late-spring and matures in September or October. It is a very adaptable crop with relatively low inputs, and do quite well in the northeast climate. Growing sunflower in the northeast (pdf). Triticale is a recently-developed cross between wheat and rye that is grown very much like wheat, with both spring-seeded and fall-seeded varieties available. It is grown both as a forage crop and as a grain for human consumption. Triticale is self-pollinating and should be treated much like wheat and other small grains; spring triticale is often grown in places where drought is of concern, as it can use water more efficiently than many other spring ceareals. Growing triticale in the northeast (pdf). Many less well-known grains are being grown in the northeast right now, either in trials, home-scale farms and gardens, or for commercial production. These include quinoa, emmer, kamut, and amaranth (pictured at right). Some of these grains are being trialed experimentally but many are used regularly as a companion to other crops, animal feed, or as an addition to a successful crop rotation. Many of these more obscure grains are particularly popular in natural foods stores and are sometimes adequate substitutes for more conventional grains for those with gluten or wheat sensitivities. Wheat was once grown in the northeast in great quantities, and is a strong part of our heritage. With an increase in demand for local foods (including flour, bread, and other baked goods), there has been a recent and exciting resurgence of wheat production. There are a few different types of wheat grown in the northeast: soft wheat, which is high in starch and good for pastry flour, can be either white or red winter wheat; hard wheat, which can be spring-seeded or fall-seeded but is usually red, is high in protein and gluten and makes good bread flour. Winter wheats, planted in late summer or fall and harvested the next summer, generally produce more grain and straw than spring wheats, and control spring weeds more efficiently because of their relative height advantage. Spring wheats are planted in spring and harvested in the fall, and often produce higher quality grain with a lower yield. A few growers in the northeast also dabble in durum or semolina wheat, primarily for pasta, but it is difficult to grow and the plants’ height makes the crop susceptible to mycotoxins like Fusarium. There is a wide range of information available on growing wheat, both on a small scale and for commercial production. We hope to see even more opportunities for growers, millers, bakers, and consumers to enjoy locally-grown wheat here in our northern climate. MORE INFORMATION AVAILABLE ON UVM EXTENSION’S NORTHWEST CROPS AND SOILS TEAM WEBSITE! Click here.